Army Sgt. Lucas Simmons, a trained sniper from the Rhode Island National Guard’s 3rd Platoon, Alpha Company, 1-182 Infantry Regiment and North Smithfield, R.I., native, observes as Air Force Staff Sgt. 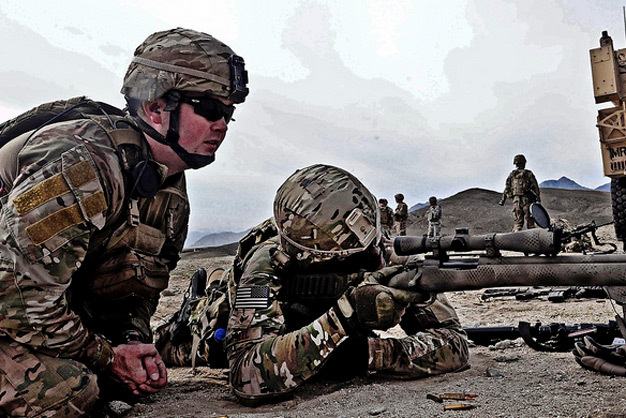 Abner Cornell fires the M24 Sniper Rifle November 7, 2011 near Forward Operating Base Mehtar Lam in Laghman province, Afghanistan. Cornell and other airmen received instruction from Simmons and other soldiers on advanced weapons like the MK-19 grenade launcher and M2 .50-caliber machine gun during a training mission. The pair are assigned to the Laghman Provincial Reconstruction Team. Photo by the US Army.